The following article was authored by Ileana Najarro and originally published in the Houston Chronicle. The men in hardhats compacting fake stone, pouring concrete and handling other jobs on the Museum of Fine Arts, Houston work site typically are paired up based on experience levels. Thus, a 20-year construction veteran often finds himself working alongside someone with just weeks under his belt. 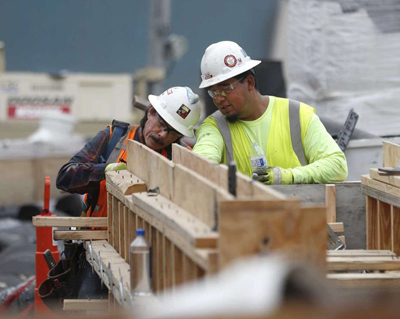 It's a vivid illustration of what industry leaders say is an ongoing struggle in a city forecasting more commercial and residential building projects this year even as a recovering energy business beckons skilled workers with higher pay. There may be enough skilled construction workers to meet demand this year, but that could change dramatically by early 2019. As the baby boomers continue to approach retirement and immigration crackdowns continue, firms that procrastinated in building up the next generation to replace them face a 20-year skill gap in their workforce. Meanwhile, an improving economy, corporate tax cuts and Hurricane Harvey reconstruction efforts are putting more jobs on their schedules. “Everything is focused right now on going to college after high school when there are plenty of good-paying jobs in Houston that don’t require a degree,” Brandon Willis, spokesman for the International Union of Operating Engineers Local 450. "The fact of the matter is there is a shortage," Jerry Nevlud, president of the Associated General Contractors of Houston, said recently. Local construction firm McCarthy factored in skilled-labor shortages when preplanning its work on the MFAH expansion, senior project superintendent Shawn Morris said. The less skilled a workforce is, the longer it takes to complete a job. That increases costs and potentially could lead to more workplace injuries. While the MFAH work is set to conclude on time, some craft services are already seeing delays. Will Holder, recently retired president of Trendmaker Homes, said cabinet makers are at capacity in Houston right now trying to fill orders for homes damaged by Harvey as well as tending to a pre-existing backlog. There is an expected uptick in residential construction this year, Holder said, but it won't surpass pre-recession growth rates. Gradual growth is preferred, he added, because the existing skilled labor pool wouldn't be equipped to handle a boom. On the commercial side, steady growth is expected across the Houston region in private office space, warehouse, K-12 and higher education, as well as the medical and arts sectors. Local industry leaders attribute much of this commercial demand to recovering oil prices and the subsequent investments made in public construction projects by energy companies. Yet some are concerned about too much good news in oil and gas. Russell Hamley, president of Associated Builders and Contractors in Houston, said other commercial sectors cannot match the pay offered by the oil and gas industry. There's worry that whatever skilled workers are available will migrate to oil and gas, leaving other contractors scrambling. Typically contractors look to other states for workers to fill gaps, risking hiring those without the desired skill level, Hamley said. For others, the alternative lies in hiring an immigrant labor force. Yet this latter option is no longer as guaranteed as it seemed not long ago. Stan Marek, of Houston construction firm Marek Bros., said immigration policies such as Texas' Senate Bill 4, which allows local law enforcement officers to question a detained person's legal status, have driven immigrant construction workers out of the state. Then there's the end of Temporary Protected Status for Salvadorans. Of the 36,300 Salvadoran TPS holders in Texas, 20.9 percent work in the state's construction industry. As their protection from deportation phases out within the next 18 months, their soon to be ineligibility for employment further compounds the industry's existing skilled labor shortage, Marek and others said. A longer-term solution is increased focus on certification and apprenticeship programs. At the International Union of Operating Engineers Local 450 office in Dayton, apprentices aged 18 to 52 receive three years of hands-on and classroom training for operating cranes and other heavy machinery. The program, free to applicants, is an earn-as-you-learn deal with some participants making $85,000 a year as part of their training, union spokesman Brandon Willis said. Willis noted that training programs have always existed within the construction industry with benefits and high wages, but contractors' investments in them and applicant interest hasn't kept up over several years. He also cited an increased federal push to get more high school students into higher education the last several years. "Everything is focused right now on going to college after high school when there are plenty of good paying jobs in Houston that don't require a degree," he said. All workers on McCarthy's MFAH project are enrolled in either the Houston-based Construction Career Collaborative program or McCarthy's internal training program. Project superintendent Morris said more firms are making such investments, but he estimates it will take at least 10 more years to see widespread increases in construction workforce skills across the board.